T-Mobile drops two new tablets into the mix today: The T-Mobile SpringBoard and the Samsung Galaxy Tab 7.0 Plus. The two 7-inch tablets flesh out the company's offerings, which also include the Samsung Galaxy Tab 10.1, and the still-available 8.9-inch T-Mobile G-Slate. The pricing makes them the first tablets from T-Mobile introduced with T-Mobile's value plan scheme. The value pricing--launched this summer for phones and tablets--allows a buyer to pay the device's down payment and then pay an additional $10 a month for 20 months. (Consumers who already have a T-Mobile phone contract can get a $10 monthly discount, which offsets the cost of the hardware). The SpringBoard's up-front cost seems reasonable at first--$180--but its price over the long haul will make a bigger dent in your wallet than you may expect. That $180 “down payment” is in addition to the 20 monthly payments, for a total cost of $380 (including T-Mobile's $50 mail-in rebate). The Galaxy Tab's down payment price is $250, with the same monthly payment requirements for a total cost of $450 (including the mail-in rebate). Monthly service starts at $30 a month for a 2GB mobile broadband plan. The SpringBoard was already shown by T-Mobile at the fall CTIA mobile show. The tablet is a U.S. version of Huawei's MediaPad, and it looks to be a solid offering. The biggest point of distinction here: The T-Mobile SpringBoard is the first tablet to ship with resolution of 1280 pixels by 800 pixels, which means its display is great--particularly when it comes to text quality. This 0.88-pound, dual-core 1.2-GHz Snapdragon tablet has 1GB of RAM and 16GB of storage, plus a micro-HDMI out and a microSD Card slot. Meanwhile, just to add to consumers' choices, T-Mobile also announced that Samsung's Galaxy Tab 7.0 Plus will be shipping on the carrier as well. The Galaxy Tab has slightly sleeker lines than the SpringBoard, and weighs 0.11 pounds less. Whereas the SpringBoard seems aimed at families (given some of the preloaded software), this model targets home entertainment, with the WildTangent Games service preloaded (you get some games for free, and others can be purchased or rented). Weighing less than a can of soda, the Samsung Galaxy Tab 7.0 Plus is one of the lightest 7-inch tablets on the market, which the company says makes it easy to use to watch popular TV shows and movies, download full-color magazines, compete in multi-player gaming and more --all while on the go. Also on board: an IR port and Peel's universal remote and TV discovery app. 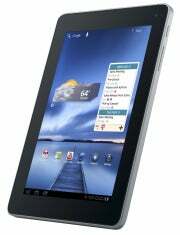 Like the SpringBoard, the Tab 7.0 Plus has 1.2-GHz processor, 16GB of memory, and the Android 3.2 (Honeycomb) operating system. 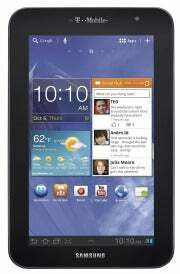 The Samsung Galaxy Tab 7.0 Plus is equipped with a 1.2 GHz dual-core processor, 1GB of RAM, 16 GB of internal memory and a microSD card slot.